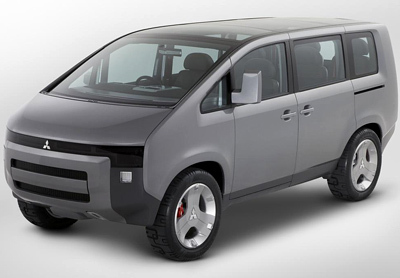 Introduced at the 2005 Tokyo Motor Show, the Mitsubishi Concept D:5 was a vehicle designed to preview the next generation Delica minivan - a Japan only model. At a guess the concept's D:5 name stands for 'Delica' and 5th generation. 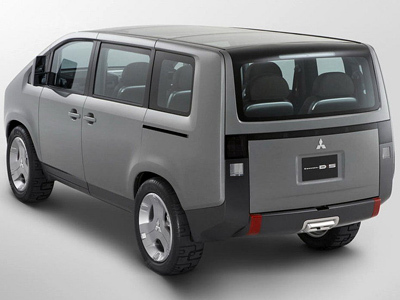 The D:5 was based on the Mitsubishi Outlander platform and featured the same AWD layout. 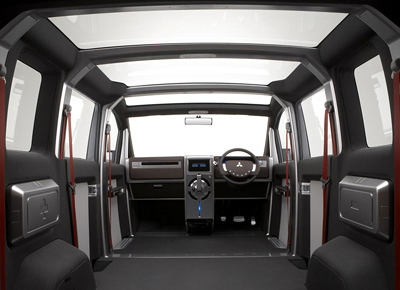 The monobox design means the D:5 offers the most interior space possible. A good thing when the vehicle is designed solely with the purpose of hauling as many people, or as much cargo as possible. With a reasonably high ground clearance and its 4WD drivetrain the D:5 concept had some mild off-road ability, which should be of comfort for those who like to take the road less traveled. Advanced safety systems were a major feature of the D:5's design. Ten sensors located all around the vehicle can detect pedestrians and nearby objects, if they sense a possible collision, an audible warning is emitted to alert the driver to take action. A lane departure warning system is also fitted, this helps make sure the driver doesn't stray out of their lane on the highway by mistake. The final active safety system is an advanced radar-controlled cruise control system which keeps the car at a safe distance from the vehicle ahead. Powering the Mitsubishi Concept D:5 is a 2.4 litre inline 4-cylinder engine which produces 168 horsepower and 226Nm (167 lb-ft) of torque. The transmission is handled by a six-speed CVT (Continuously Variable Transmission).